From what I can gather, A Wrinkle in Time is a much beloved children's classic in America. I personally hadn't even heard of it before I started reading Book Riot posts. With a few challenge prompts requiring me to read a children's classic, it was a the perfect excuse to pick it up and see what the fuss was about. We took a time wrinkle as well as a space wrinkle. It’s very easy to do if you just know how. Meg is a clever but stubborn girl, who exasperates her teachers and lives with her mum and three brothers. The school thinks her dad has left them and she's in denial but Meg has faith in him. Both her parents are scientists and Meg loves science too. I can see this being a breath of fresh air in the 60's, especially if you were a nerdy little girl. There is no gender stereotyping here. There's a really long build up to the adventure starting, laying out the home situation and quite a lot of characters for such a short book. Eventually Meg travels across space in order to rescue her father and save the Earth, along with her little brother and Mrs Which, Mrs Who and Mrs Whatsit. It does introduce some quite complex ideas, such as the wrinkle of the title, talking about folding space in order to travel, but the characters were a bit simplistic for my taste. Maybe if you aren’t unhappy sometimes you don’t know how to be happy. Meg learns that parents are flawed people and you shouldn't judge someone by their appearance. 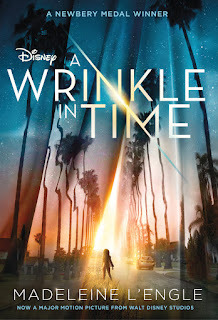 It tries to explain differences in perception by including aliens with no sight but who can perceive so much more than Meg who is limited by her reliance on vision. Oh and love conquers evil, of course. After a slow start, it seemed to be resolved very quickly and the ending was rushed, however it is part of a series. I struggled with reading IT as it and not as I.T. leading me to keep imagining the great evil was technology. Or a bunch of geeks in the basement. I don't think this term was in regular use until the 90's though, so it's more a modern reader problem. Maybe I would have loved this book as a child, but I was more into ponies than science, and I still think I'd have wanted more complex characters, even back then. I hadn't heard of this either before it was made into a film and Twitter started getting excited. I guess it wasn't really a thing over here? I'm sort-of interested in the film, in that I'll watch it if it falls into my lap, but not enough to read the book. Thanks for telling me what it's actually about though, as I didn't have a clue! I'd probably watch the film if it was on at Christmas or something. I definitely think a lot of the love for the book is nostalgic, it's one of those children's books that's clearly for children, not like all the cross-overs we have these days. I've been vaguely aware of it for years - I think my sister nabbed a copy when the school library had a clear-out - but still haven't got around to reading it. I'm definitely interested in going to see the film, and may have to finally borrow her book soon too.